Swap an agenda in your score area with an agenda in the Runner's score area. This card is bonkers, right? Breaking News is easy to score with a click leftover (either never-advanced or with AstroScript Pilot Program / SanSan City Grid / Early Premiere / Political Dealings), and-- would you look at that-- gives the runner tags. This feels like a really strong way to round out NBN tag & bag decks: if the runner can avoid being killed (with some combination of Plascrete Carapace, Paparazzi + Wireless Net Pavilion + Fall Guy, Sports Hopper or whatever), they can still be made to pay very dearly for taking a tag. Global Food Initiative is an obvious target (low risk, high reward and point swing). Other popular targets of Media Blitz apply here as well: in-faction you have Restructured Datapool (combine with Aryabhata Tech for Maximum Hijinx) and maybe Puppet Master. Out-of-faction you have Mandatory Upgrades and Government Takeover if you are feeling dangerous. I feel like if this becomes a thing (and I'm pretty sure it will), we'll see a lot more New Angeles City Hall around. Let a runner steal Restructured Datapool or another 5/3 that you would ordinarily be unable to score. Maybe even Vanity Project if you're feeling saucy. If you want to be extra rude, have 15 Minutes scored already and swap the 5/3 for that, then shuffle it back into your deck on your next turn. Can also use SEA Source if you're rich. This is very strong tag punishment, even against runner decks that have ways to deal with killshots. Also can't wait for the inevitable back-and-forth vs. a Turntable deck. I really have a beef with this card. Flavor. Agendas are projects that require time and investment of the Corp. This is represented by the Clicks and credits needed to Score. The bigger the Agenda, the more time and investment you need. The Corp just don't simply "acquire" all the needed equipment, infrastructure and staff needed to run a Global Food Initiative just because the Corp invested time and money tracking down the runner (Breaking News), and coerce him into trading the GFI plans over. 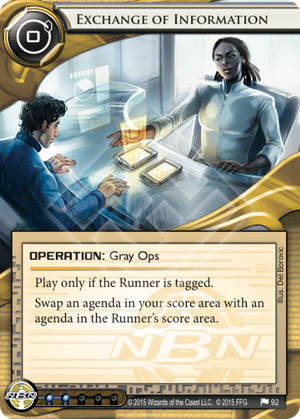 Since the flavor of this card is to "Exchange information", it would make more sense to swap an agenda from the Corp's HQ rather than from the Corp's scoring area? This isn't the first card that disregards "Flavor" in favour of mechanics. There are a lot. I can forgive them most of the time, because I can usually throw some loose logic to rationalise them. But there is something about this one that really sticks in my craw.